This is where your latest blog posts will show up. You can change this text in the options. Your Student Show Opens Tonight! Submit Your Work to our Pop Up Student Show! Schedule an appointment with Kate Reeves, student advisor! Green Graphics and Printing is a graphic and website design studio as well as an eco-friendly print shop. We have a casual and fun work environment in a pleasant atmosphere. The owner is a UCLA Extension DCA grad! We are seeking a full or part time Graphic Design intern in our Woodland Hills office to gain hands on experience working with an extremely wide variety of projects. We work with both small and large companies and design everything from logos, stationery, postcards, and brochures, to product packing, books, custom die cut collateral and websites and many other different types of projects. – Knowledge of Photoshop and Illustrator. Knowledge of InDesign a plus. – Must love dogs. We bring ours to work, and you can too if they get along with our big pooches! – We are looking for someone who can work 2-3 days/ week 6-8 hours a day. • Work start to finish on projects, and you will be allowed the use of some projects that you create to use in your portfolio. • We never have the same job twice, so you will always have something new to work on! • You will never be made to run errands, get coffee, file papers, or do office work. We are here to help give you real world experience and teach you tips and tricks you may not have learned in school. We will gladly help answer any questions, and you can even use our laser printer to make nice prints for your portfolio and other class projects, free of charge. Please email us a resume and/or portfolio to info@gotgreenprinting.com . 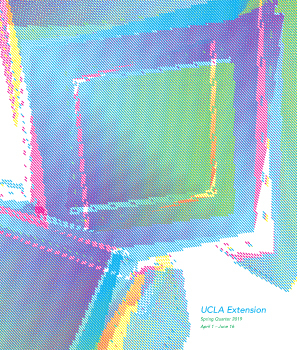 UCLA Extension Visual Arts © 2019. All Rights Reserved.